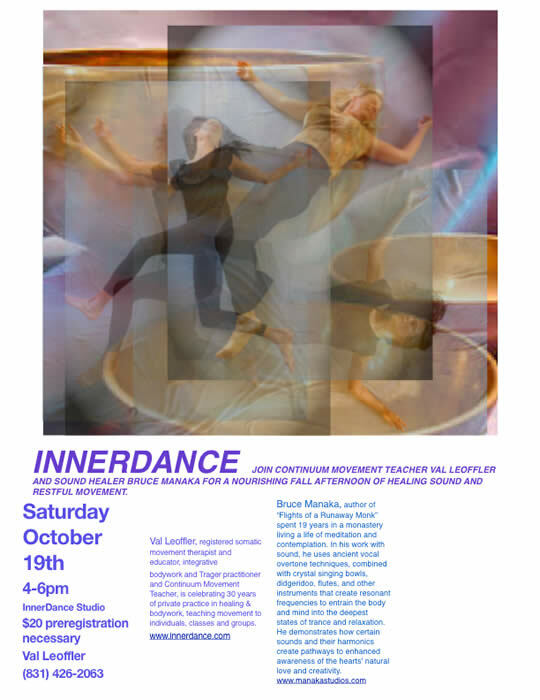 Join Val Leoffler, Registered Somatic Movement Therapist, bodyworker and Continuum Teacher in this nourishing afternoon dive exploring Continuum, somatic movement and the emergent creative flux. Held in a spacious Westside Santa Cruz studio fully equipped with cushions, blankets, chairs, Exploreboards, small & large physioballs, rollers, ties, pelvic swing & other props for optional use & comfort. 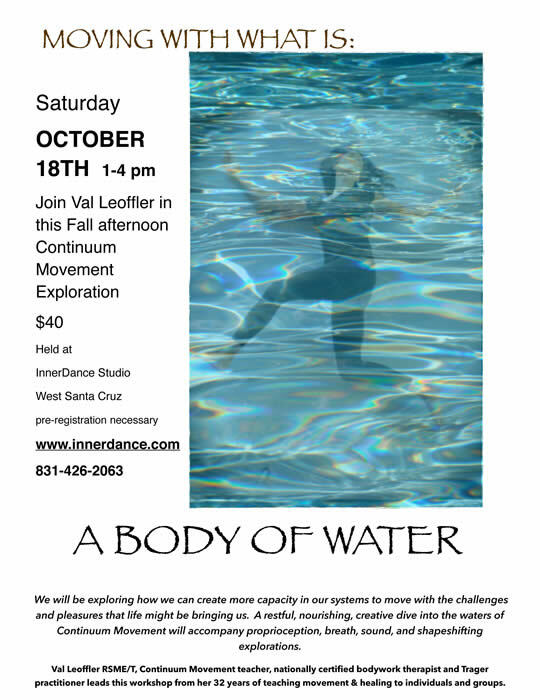 InnerDance Studio is conveniently located a few minutes from downtown Santa Cruz near the ocean. 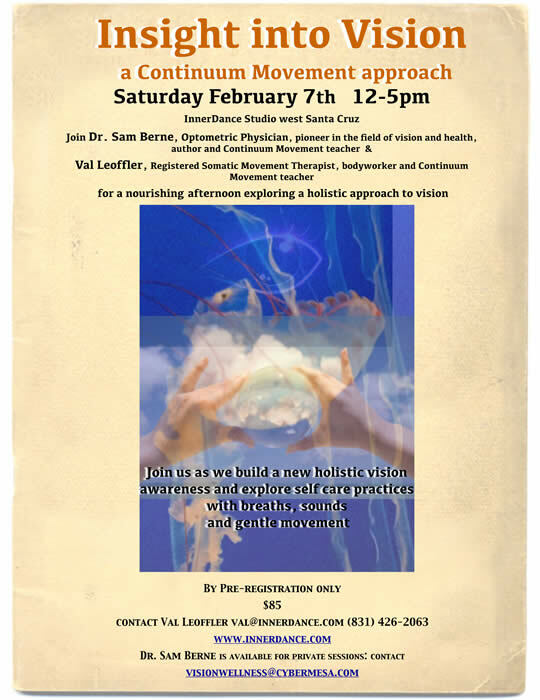 Join us as we build a new holistic vision awareness and explore self care practices with breaths, sounds and gentle movement. Wave, spiral, radiant star, cellular globe: these are patterns that emerge & dissolve in the inner terrain of our tissues, psyches & lives. Join me as we discover what wishes to shed, dissolve & reappear in new form. 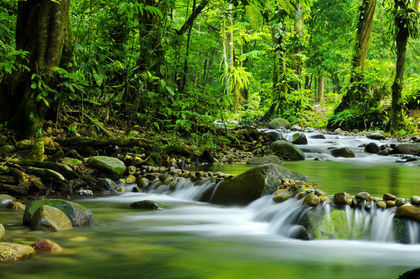 We will be guided by images & sounds of nature. Discover how our movement supports & nourishes our new growth: plant a new movement seed for yourself! Santa Cruz near the ocean. We will be exploring how we can create more capacity in our systems to move with the challenges and pleasures that life might be bringing us. 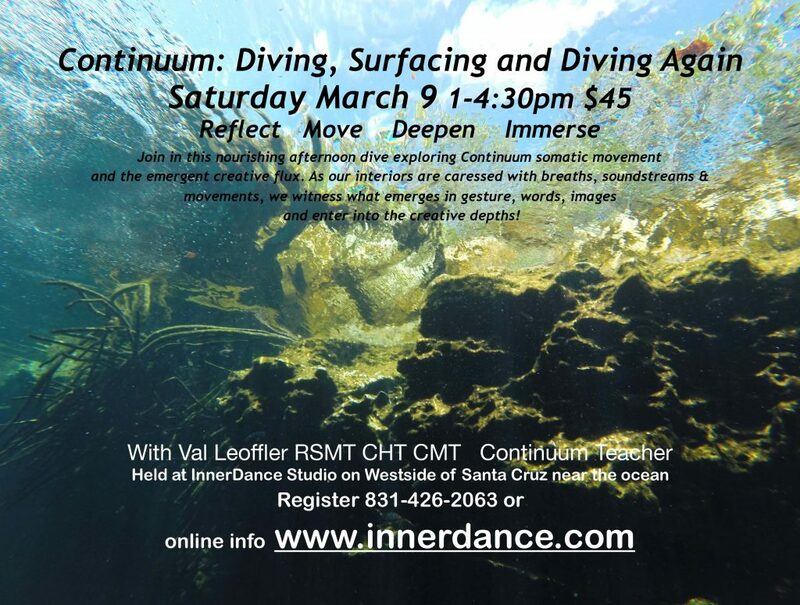 A restful, nourishing, creative dive into the waters of Continuum Movement will accompany proprioception, breath, sound and shapeshifting explorations. Val Leoffler RSME/T, Continuum Movement teacher, nationally certified bodywork therapists and Trager practitioner leads this workshop from her 32 years of teaching movement & healing to individuals and groups.